• Headache and compromised visual function (loss of peripheral vision and blurred vision) caused by the actual tumor mass and its close proximity to the optic structures. • Loss of other hormonal functions (i.e., LH, FSH, TSH, and ACTH) caused by massive tumor size compressing the anterior pituitary lobe. • Absence of regular menstrual periods (amenorrhea), impotence, and decreased libido caused by disruption of the gonadotropin secretion. 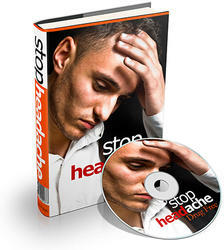 • Excessive sweating, joint pain, nerve pain, and abnormal neurologic sensations (paresthesias) related to elevated GH and IGF-I levels. • Perform MRI examination and CT of the pituitary to locate the tumor and validate the diagnosis. • Without obvious pituitary tumor but proven acromegaly, measurement of GHRH may be helpful to detect ectopic tumors. Adapted, from Sheehan AH, Yanovski JA, Calis KA. Pituitary Gland Disorders. In: Dipiro JT, Talbert RL, Yee GC, et al., eds. Pharmacotherapy. A Pathophysiologic Approach. 7th ed. New York: McGraw Hill, 2008:1284. Pharmacologic therapy is often necessary for patients in whom surgery is not an option. Somatostatin analogs, GH receptor antagonists, and dopamine agonists are the primary pharmacologic therapies used for the management of acromegaly (Table 46-2). Pharmacologic therapy avoids hypopituitarism and other surgical risks. Somatostatin analogs are generally well tolerated. Common adverse effects include transient GI disturbances such as diarrhea, abdominal pain, flatulence, constipation, and nausea.18 These adverse GI effects usually subside within the first 3 months of therapy. Somatostatin analogs inhibit gallbladder contractility and decrease bile secretion; therefore, their major adverse effect is development of biliary sludge and asymptomatic gallstones (cholelithiasis). Biliary sludge is a predisposing factor for the high incidence of cholelithiasis observed in up to 20% of patients.5 Development of gallstones typically occurs in patients treated for 12 months or longer and is unrelated to age, gender, or dose. Somatostatin analog-induced gallstones should be managed according to standard guidelines.5 Additionally, somatostatin analogs may alter the balance of counterregulatory hormones (i.e., glucagon, insulin, and GH), resulting in either hypoglycemia or hyperglycemia.18 Octreotide also may suppress pituitary release of TSH, leading to decreased thyroid hormone secretion and subsequent hypothyroidism in 12% of treated patients. Close monitoring of thyroid function and glucose metabolism is recommended. Sinus bradycardia, conduction abnormalities, and arrhythmias have been reported with octreotide and lanreotide. Due to the potential adverse effects of the somatostatin analogs, concomitant use with insulin, oral hypoglycemic agents, ^-blockers, or calcium channel blockers may require careful dosage adjustment. Somatostatin analogs also may alter the bioavailability and elimination of cyclosporine, and monitoring of cyclosporine serum concentration is necessary. «1 rrjj IM wy 2 WW "*1! AO frtjujiiiti Ml 4 wpOfcj"
DiuDmixK* i(■-.-'jfo' ' IMI lufKiion ir-Mi efcTB-abed -ai teas! S x ihe tjppcr frrit o(nmmjJ a tTjmjKTifWM- dt IMH 3 x ufpei in* ci normal nwih .iff* KKiftsw hi wium KijJ t+taubc! M LH ki J11' DS taWi IfTiiuiVYiifH. lirrf- to rr«5 ovwy 4 wvi+. ■. pegvisomant and somatostatin analogs. 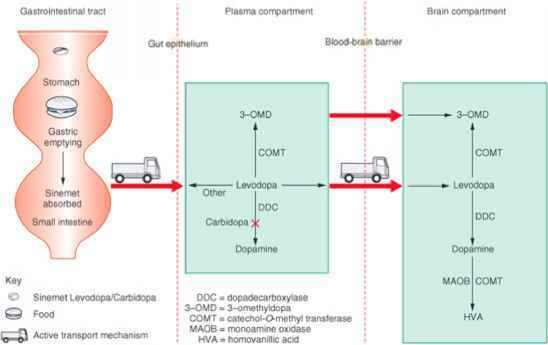 Therefore, obtain baseline levels oftransam-inases, total bilirubin, and alkaline phosphatase prior to initiating therapy and periodically thereafter. Caution should be used when administering pegvisomant to patients with elevated liver function tests, and therapy should be discontinued in the presence of clinical signs and symptoms of hepatic injury. 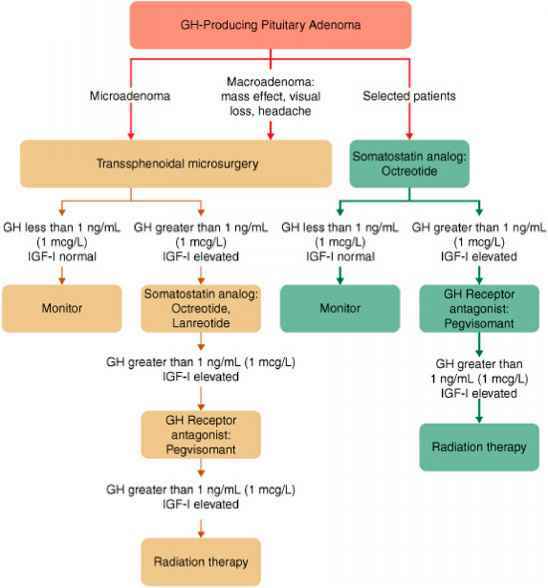 Radiation therapy is an important adjunctive therapy in patients with residual GH excess following surgery or pharmacologic therapy. Treatment involves the use of radiation to destroy rapidly growing tumor cells and often results in a reduction in tumor size. A major complication resulting from radiation therapy is hypopituitarism, requiring lifelong hormone replacement. There is also the potential for optic nerve damage if the pituitary tumor is near the optic tracts. Radiation therapy may take 10 to 20 years before its full effects become evident.10 Owing to delay in onset of radiation effectiveness, pharmacologic therapy often is indicated as bridge therapy. Men and women who desire to have children should be warned that pituitary irradiation therapy may impair fertility. • Lifelong biochemical assessment is critical for determining therapeutic outcomes. • Because up to 10% of pituitary tumors may recur within 15 years following sur-gery,6 continual postoperative monitoring is recommended. • For patients treated with somatostatin analogs, assess baseline fasting blood glucose, thyroid function tests, and heart rate. Thereafter, periodically monitor patients for adverse reactions such as GI disturbances, glucose intolerance, signs and symptoms of thyroid abnormalities, bradycardia, and arrhythmias in patients receiving long-term somatostatin analogs. Reevaluate IGF-I and GH levels at 3-month intervals to determine therapeutic response. Because the frequency of symptomatic gallstones associated with somatostatin analogs varies among studies, the need for routine ultrasound evaluation remains controversial. However, ultrasonography of the gallbladder would be indicated if the patient develops symptoms of biliary abnormalities.